Almighty God, from the house of Your servant David You raised up Joseph to be the guardian of Your incarnate Son and the husband of His mother, Mary. Grant us grace to follow the example of this faithful workman in heeding Your counsel and obeying Your commands; through Jesus Christ, our Lord, who lives and reigns with You and the Holy Spirit, one God, now and forever. Amen. Reflection: I think March 19th, Joseph, Guardian of Jesus should be observed by the Church as Fathers’ Day, as the following reflection by Fr. Patrick Henry Reardon in Touchstone magazine makes clear and as does the issue of Touchstone on St. Joseph also makes clear. (BTW: Touchstone is an excellent Christian and orthodox magazine). There is something strongly impressive in the Bible’s final remark on the life of St. Joseph: “Then [Jesus] went down with them and came to Nazareth, and was subject to them. . . . And Jesus increased in wisdom and stature, and in favor with God and men” (Luke 2:51–52). The Son of Godwas raised, that is to say, as any little boy should be raised, growing day by day in the practical and moral skills of life, the formation of character, even as he grew in height and build. While God’s Son assumed humanity in his mother’s womb, it was Joseph who taught him what it means to be a man. Thus, Joseph was to leave the forming mark (charakterin Greek) of his own manhood on the God-Man. Jesus, in his hometown, was known as “the carpenter’s son” (ho tou tektonos huios—Matt. 13:55). Few if any writers have shown as much exegetical insight into St. Joseph, I think, as Bernard of Clairvaux, who preached a homily on this saint back in the twelfth century. Bernard spoke of Joseph as “the man of virtue,” who “deserved to be so honored by God that he was called, and was believed to be, the father of God” (meruit honorari a Deo ut pater Dei et dictus et creditus sit). 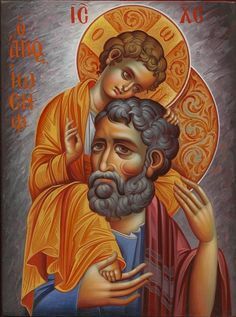 Detecting the subtle suggestions dropped in the Gospel of St. Matthew, Bernard compared St. Joseph to his Old Testament counterpart, Joseph the Patriarch. Both men, Bernard noted, were men of chastity, unwilling to touch women who did not belong to them. Each man, likewise, was driven into Egypt by the ill will of others, in the first case by the older sons of Jacob, and in the second by King Herod. In the biblical genealogies, Jesus’ lineage is traced back to David, not through his mother, but through Joseph, to whom Jesus had no biological relationship (Matt. 1:16; Luke 3:23–31). Thus, Jesus inherited the messianic title “Son of David,” not through Mary, but through the man who served him, literally,in loco parentis (in place of parents). Every vocation is unique, surely, in the sense that the Good Shepherd calls each of his sheep by its own proper name. Still, there was something more particularly unique about the vocation of St. Joseph. Just how does a man learn the proper form and method for being the foster-father of God’s Son and the spouse of that divine Son’s virgin mother? One suspects that there were no manuals on the subject. Joseph was obliged simply to follow God’s call wherever it led. Like Abraham, “he went out, not knowing where he was going” (Heb. 11:8). And if Abraham, in thus following God by faith, is called “our father” (Rom. 4:12), there must be some sense in which St. Joseph serves as our foster-father. With so distinctive and demanding a vocation, we might excuse Joseph if, on occasion, he sometimes felt anxious and insecure. The available evidence, however, indicates that this was not the case. Joseph appears four times in the Gospel of Matthew, and every single time he is sound asleep. Whatever troubles Joseph endured, they did not includeinsomnia. Joseph’s vocation was not simply difficult; it was impossible. Consequently, he realized that all of it, in the end, depended on God, not himself.